Proud to have been a part of the team that spent the last three months putting this coat drive together. In only our third year of doing so, we collected over 1400 coats from the community and distributed almost 1300 of them in a two hour span this past Sunday. The coat count doesn’t even include the kids clothing, blankets, hats and gloves that we also provided to try and help keep those in need warm this year. A big thank you to everyone who participated in this work, especially to those who gave. Plenty of amazing stories to tell. 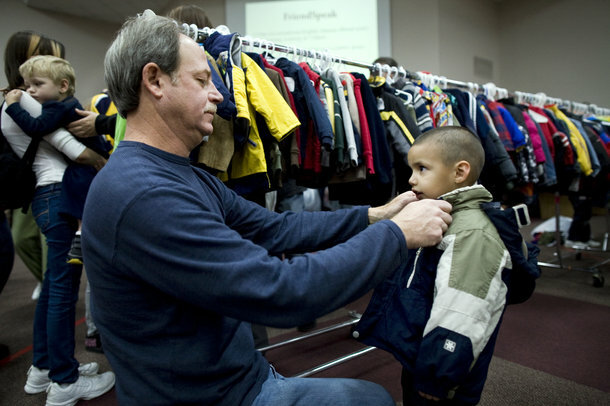 Stories of parents who needed coats for their children but chose to bring their old ones to donate that were too small for their kids. Stories of people who traveled from cities all around to participate after seeing it on our website or remembering from years past. Stories of adults who used to attend our church when they were children and now realize that maybe they should be providing that opportunity for their kids as well. Lives were touched and hopefully seeds were planted. Although it took a lot of hard work and time spent, I’d bet that almost any group of people can put something like this together in their own neighborhood. A little sweat equity can keep the overhead low and you just never know how many people can be affected.